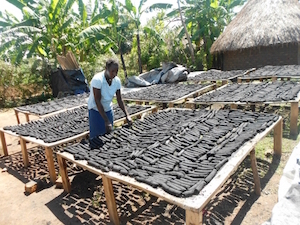 -It burns cleanly, reducing exposure to the smoke that causes respiratory infections -It uses agricultural waste materials, and therefore does not contribute to deforestation -Charcoal from agricultural waste can also be paired with complementary technologies like fuel-efficient stoves to further reduce fuel consumption. To make the charcoal, agricultural waste materials appropriate to the season and the region are carbonized in a kiln made from a 55-gallon oil drum. The carbonized material is then crushed and formed into briquettes using a small press and a binder made from a source of starch such as cassava, a common root vegetable also known as yucca and manioc. The process takes a few hours and requires only simple devices which can be made from local materials. D-Lab is building a global network of innovators to design and disseminate technologies that meaningfully improve the lives of people living in poverty. The program’s mission is pursued through interdisciplinary courses, technology development, and community initiatives, all of which emphasize experiential learning, real-world projects, community-led development, and scalability.